While some bouquets are meant to turn heads, others create beauty by simply complimenting the space around them. Our Soft & Elegant bouquet falls under the latter, adding a gentle magic to any room. 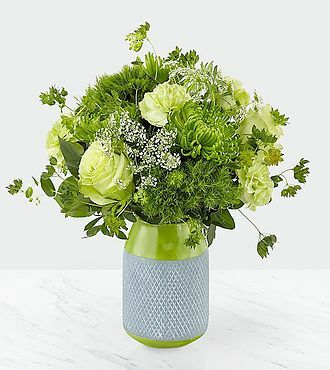 By interweaving roses, spider mums and carnations with Queen Anne's lace and green trick dianthus, our team of FTD florists has carefully curated a bouquet that shines with a simple grace. STANDARD bouquet is approx. 13H x 12W. DELUXE bouquet is approx. 14H x 14W.